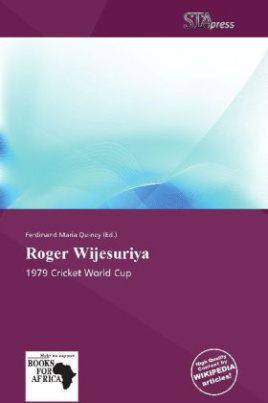 Roger Gerald Christopher Ediriweera Wijesuriya (born 18 February 1960, Moratuwa) is a former Sri Lankan cricketer, who holds the worst bowling average in Test cricket.Wijesuriya represented Sri Lanka from 1978-79 until 1985-86, but never impressed in international cricket, although his first class and List A statistics were quite decent. His first match for Sri Lanka was a one-day game against West Indies, where he took the wicket of Larry Gomes as Sri Lanka won by seven wickets. Wijesuriya was also picked for the 1979 tour of England, where he ended up with ten wickets at an average of 37.70 in five first class games, including three for 13 against Scotland in a rain-hit three-day game.